I had never felt much attraction to the Sorrowing Mary until I visited Sicily. Here the Holy Week festivities have as much to do with Mary, it seems, as with Jesus. This is probably true since in Sicily the Earth Goddess Demeter is very much present in Mary. One senses that Demeter’s journey to the depths of the earth in search of her child strongly parallels Mary’s search and Mary’s sorrow. Demeter was a fertility goddess, whose daughter Persephone had been abducted by Hades into the underworld. Psychologically speaking, her search for Persephone (daughter, meaning “sprout” or new form of the mother) can be viewed as a search for herself. Persephone is the “seed” dying into the earth and returning in the spring as the new shoot. The story and its vegetation imagery is about personal rebirth. And it echoes the stories of earlier goddesses like Inanna and Isis searching for their sons and/or lovers who have gone into the land of death. There is no question here that in Sicily Mary plays a unique role in the Easter Mysteries similar to Demeter in earlier times. Mary is not often pictured going down into the netherworld, though some apocrypha stories (texts not included in the official canon) describe her descending into Hell to plead for the release of sinners. These are faint traces of the real similarities between Mary and the Greek Mother Demeter searching out the lost child. After Persephone’s abduction, Demeter roams the earth in grief and rage and during this time famine covers the earth. In her suffering and grief, she pleads with Zeus to return her daughter and he agrees. When Persephone returns, famine and blight disappear, the earth blooms. Mary’s suffering plumbed the depths as she watched Jesus’ way of the cross and his death. 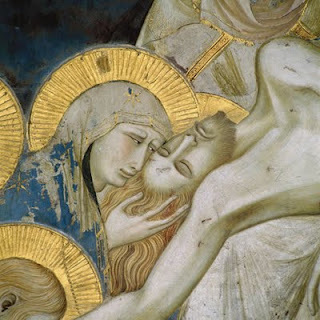 “Christ’s passion is narrated through the perspective of the Virgin and becomes the Virgin’s passion.”(1) Many believe that Mary’s suffering equaled that of Jesus. Mary is the Adolarata, the Suffering One. Today in the town of Trapani where Christian, Greek and Arab worlds meet, an eighteen hour Easter procession celebrating these mysteries begins on Good Friday. My niece Barbara and I had been staying in Erice, a village perched high above Trapani, the location of an ancient temple to Venus, Goddess of Love. We planned to leave before the festivities, but luckily were able to view the preparations housed in the local church. Inside we viewed magnificent Stations of the Cross which would be carried throughout the town. These are life sized figures with wood base and what looks like cloth maché covering. The figures are placed on platforms decked with multi-colored flower arrangements. In medieval times these stations or scenes, representing events leading up to the death of Jesus, were carried by local guild members: bankers and farmers, butchers and tanners. Today one can read on each platform something of the history and the particular guild members who participated. The tradition continues. Slowly I walked around the church until I stopped short. There on the left side of the altar stood a statue of Mary unlike any I had seen. She was robed in black, a silver sword piercing her heart, an image of her anguish at the loss of her child to the dark underworld. Carried high on its platform of considerable weight, the statue follows the long procession as the crowds cry out Mary’s lament, “Where is he?” (This cry echoes the earlier Babylonian Mother Goddess Ishtar mourning the loss of Tammuz, her suffering son lover whose rising would bring fertility to the land.) One can hear Demeter as well crying, “Where is she?” It is the cry of a mother who has lost her child. Here pagan and Christian ritual meet at a depth of human emotion that blurs their differences. Mary as Sorrowful Mother has touched my heart. She has entered into that place of my personal suffering, that place that generates mourning, healing and love. Mary Dolorata becomes a model for every woman’s suffering and loss. She is comforter because we identify with her sorrow. Her suffering, like Demeter’s, is redeeming, for, as the Gospel affirms, she became the mother of John and of the entire human race. (John19:26-27) In a talk on the Feast of Mary’s Nativity in September, 2004, Pope Paul II quoting St. Irenaeus said that the Sorrowful Virgin is in a sense “The cause of salvation for herself and for the entire human race.”(2) This early Christian writer echoes a belief held through the centuries that Mary like the great Earth Mothers of antiquity creates, “dies” and recreates the world. In so doing she images the value of our personal journey to self fulfillment through our suffering. For the image of the Sorrowing Mother evokes a universal longing for rebirth, a cry of hope. How can we today resonate to this cry for the lost child? Daily we mourn the many children and adults “lost” through violence or illness. Psychologically viewed, consider adults who as children have been emotionally abandoned. Such a child has caring parents who provide for its material needs. But it has not received sufficient response to its emerging self expression. The “fit” between child and mother has not been good enough thus the child experiences estrangement, often well into adulthood. The “inner child” represents hope…a new vision, a new possibility. Its healing or “resurrection” happens through re-connection to God and its real self. Loss then is transformed by joy. From the Virgin of Tenderness to the Black Madonnas of Rocamadour and Einsiedeln my journey through images of Mary has opened me to soul depths where I sense the imageless God. We are image making creatures and throughout our life our God images change. “Unless we are completely defended and isolated from our Source,” writes, Ana-Maria Rizzuto, “the representation of God like any other, is reshaped, refined and retouched throughout life. With aging the question of the existence of God becomes a personal matter to be faced or avoided. For most people the occasion for deciding on the final representation of their God comes in contemplating their own impending death.”(3) For most of my life my God images were personal: Friend, Lover, Father, and Jesus. Mary as Mother came later. Then followed Wisdom-Sophia. It was as if the Feminine Divine urged me to “descend” into my feminine nature, my true feeling and emotion, to the realm of the Mothers. In contemplating my death, perhaps I am sensing a rebirth. In its many forms the myth of rebirth provides a model for self discovery and creation, for changing patterns destructive to self and to others. One story has it that in order to get in touch with herself Wisdom Sophia had to separate from the rational spirit world to descend into the dark earth. “The sufferings that befell her took the form of various emotions—sadness, fear, bewilderment, confusion, longing: now she laughed and now she wept. From these affects…arose the entire created world.”(4) It may be easier for us to imagine Mary ascending to the courts of heaven than to see her descending into the depths of grief. As Sorrowful One, she has done this. Her darkness and suffering is a vital part of her full humanity as it is of our own. These are a remarkable two lines. Our ancestors imaged the birth of the world through Wisdom Sophia, she who exists before all things. Are we experiencing the world’s rebirth out of chaos and violence? That too will happen, but only through the Virgin, that is, through the recovery of our connection to soul, the feminine Self at the heart of our being. Re-Imagining Mary: A Journey through Art to the Feminine Self ISBN 13: 978-0-9810344-1-6 is on sale now at the Fisher King Press online bookstore. (1) Margaret Miles quoted in Cunneen, In Search of Mary, p. 192. (2) Irenaeus, Adversus Haereses, III, 22, 4. See also Rev. Judith Gentle, Jesus Redeeming in Mary based on the theology of Louis De Montfort. (3) Ana-Maria Rizzuto, The Birth of the Living God: A Psychoanalytic Study, p. 8. (4) Alchemical Studies, CW, Vol. 13, p. 335. (5) Mysterium Coniunctionis, CW, Vol. 14, n. p. 318.